The following announcement is posted as a free service of The Western Planner, a journal for planners in the West. Please contact the agency listed below for further information. Thank you, Debbie Ehlers, Editor of The Western Planner. The Cheyenne Metropolitan Planning Organization (MPO) and City of Cheyenne Parks and Recreation Department hereby request professional services for two community plans. The principle deliverable for this project will be one document composed of two stand-alone plans for the Cheyenne, Wyoming urbanized area: a Safe Routes to School Plan for the Elementary and Jr. Highs schools, and a Pedestrian Plan for the same area. The SRTS plan should include a public input process, and overview of school data, identification of transportation barriers, proposed solutions, mapping, and an action plan. The Pedestrian Plan should include study area maps, pedestrian facilities inventory, best practices, Level of Service matrix, public involvement report, and list high priority projects. For further information or questions, contact Nancy Olson, Transportation Planner at 307-638-XXXX or Jeff Wiggins, Greenway Coordinator, at 307-638- XXXX. They can be contacted in writing at 2101 O’Neil Avenue, Room 205 or 309 Cheyenne WY, 82001. I am not affiliated with Cheyenne or Laramie County, Wyoming. I am a subscriber to The Western Planner and interested in the national Safe Routes to School program encouraging infrastructure so more kids can walk and/or bike to school. Saw this on the WP email list and reposted (took out email/phone #s, you can look them up if you’re interested). Abraham Lincoln was one of my first heroes. Growing up in the rural Midwest, he was a man of my people. As a young conservative, he was the founding father of the Republican Party. As an American, he was the man my ancestors fought for—the man who saved the Union. Get the books, and read and study them till you understand them in their principal features; and that is the main thing. It is of no consequence to be in a large town while you are reading. I read at New Salem, which never had three hundred people living in it. The books, and your capacity for understanding them, are just the same in all places…. Always bear in mind that your own resolution to succeed, is more important than any other one thing. The man and and the myth of Honest Abe Lincoln is as valid today as it ever has been. Any one of us can raise ourselves up from nothing to become President of this great nation. We can say what we will and do what we will. We can try new things, fail and live to try again another day. We each have the right and responsibility to serve a purpose greater than ourselves. 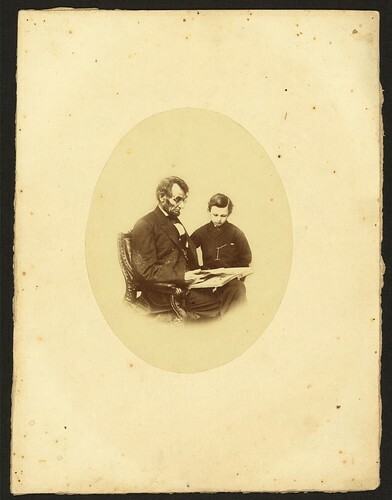 Abraham Lincoln was born on 12 February 1809. So far we have come in 200 years. So far we have yet to go. Now, so there will be no misunderstanding, it’s not my intention to do away with government. It is rather to make it work—work with us, not over us; to stand by our side, not ride on our back. Government can and must provide opportunity, not smother it; foster productivity, not stifle it. If we look to the answer as to why for so many years we achieved so much, prospered as no other people on earth, it was because here in this land we unleashed the energy and individual genius of man to a greater extent than has ever been done before. Freedom and the dignity of the individual have been more available and assured here than in any other place on earth. The price for this freedom at times has been high, but we have never been unwilling to pay that price. President Ronald W. Reagan would have been 98 years old today. Rest in Peace and may we once again find “willingness to believe in ourselves and to believe in our capacity to perform great deeds, to believe that together with God’s help we can and will resolve the problems which now confront us”. School sports now a Minnesota luxury? “Cut from the team” means something different in these economic times. Extracurricular activities are hurting. The economic crunch is coming to high school sports. Faced with budget problems, some schools are raising fees while cutting back on equipment, transportation and other expenses. Others are voluntarily cutting back on the number of games their teams play. In early February, the Minnesota State High School League could decide to make reduced schedules mandatory starting in the 2009-10 school year as a way to save money. Administrators use words like “bleak” and “troubling” to describe the outlook for high school activities…. My wife disagrees with me vehemently on the role of sports in school. She is quiet persuasive. For kids that are not on the Honor Role, eligibility for sports can be an incentive to sit through the drudgery of a public school education. And truth be told, yes, I do agree that rising activity fees means it can be very difficult for middle class kids to participate throughout the year. My wife’s kids play softball, baseball, basketball, and football; they participate in cheer leading and choir. On top of their hefty activity fees, parents are expected to pay to get into games and concerts (yes, they charge for high school and junior high choir concerts, too). I also agree: a well-rounded education requires a broad exposure to the arts and sciences in addition to core academics. I am a long-time participant and advocate of Scouting for youth. It is a game with a purpose. However, it would never occur to me to ask the taxpayers of Minnesota to help pay for our Scouting adventure. Scouting isn’t cheap, but there is value in Scouting and a Scout is Thrifty. We try to work with families to give our young men the opportunity to earn their way. We sell popcorn and wreaths. We work during the County Fair. Our parents dig deep to send their own sons to summer camp each year and the community supports our Council programs with Friends of Scouting. In difficult times, we may have to say No. Sorry, not this year. I would love to send our Scout to the centennial National Jamboree next year. That’s not likely to happen no matter how much popcorn he sells. In times like these, we need to work harder, plan better, save more. Get back to basics. Do your best.